Well, wouldja look at this! A Friday post! I thought about saving my recap for my weekly Saturday post where I rant and rave about all things half marathon training, but I decided to go ahead and do this now to avoid writing a novel-length post tomorrow. Yesterday, I ran the 12th annual Chicago Firefighters Run for the Kids 5K. As I mentioned yesterday, this was a rather spur-of-the-moment sort of race. I knew about it a couple weeks in advance but didn’t make up my mind until mid-afternoon yesterday that I would run. Because I hadn’t registered, I had to get to the race pretty early. I planned on taking the CTA to the race, but at 4:50 I still hadn’t got on the train and opted to take a cab instead. I really don’t mind taking the CTA just about everywhere, but because it’s public transportation it can take a lot longer to get from point A to point B. On-site registration closed at 6 p.m., and I expected it to take about an hour to get to the race by CTA, which meant for the fourth time in the space of seven days, I had to spring for a cab. Boo. 4:50, as you may have guessed, is awfully close to 5:00, which meant my cab got caught in a lot of rush hour traffic. Fortunately, I still got to the race around 5:20, which left me with plenty of time to register before the start. The race was held at Solider Field, a place I’ve been all of once in my life. I really had no clue where I was going, but there were a lot of other people in running clothes wandering around. I followed them to the the south lawn outside the stadium, where all of the pre-race festivities were in full swing. I registered for the race without a problem and then dropped my bag off at gear check. Right before I handed my bag over, I checked my phone and saw that I had a voicemail from a Chicago number I didn’t recognize. Lo and behold, it was someone from my property management, telling me that they’ll be showing my apartment tomorrow morning even though we’re nearly finished with the application process and despite the fact that my property manager had put a hold on our unit, which was supposed to take it off the market. Needless to say, I was fightin’ mad. I hoped my anger would fuel my running, and I began to toy with the thought of PR-ing. My anger cooled from “irate” to “extremely frustrated” by the start, though, so I didn’t have quite the angry run I was hoping for. The course began immediately east of the Soldier Field lawn and took us around the front of the Field Museum before dropping us off on the Lake Front Trail. The beginning of the race was very crowded. I ended up near the middle/back of the pack when we lined up, which meant I was surrounded by people intending to run the race much slower than I hoped to run it. This also meant that I spent the first mile of the crowded course trying to navigate my way around other runners. All of the passing made me feel like I was running pretty fast, though in reality I wasn’t breaking any records. I passed the first mile marker at 9:01 according to my Garmin, at which point I knew PR-ing would be very difficult, if not impossible, especially because the runners were not spacing out. At Monroe, the course turned around and we ended up running on the lower path right along the lake. This was about 1.7 miles in, and finally the course congestion eased up. I had upped my pace to around 8:30 by this point and was able to hold on to that as we ran around Shedd Aquarium and under Solidarity Drive to get back near Soldier Field for the finish. To be honest, I’m not really sure what my was my final time. Officially, I ran a 27:04, an obnoxious time considering that’s exactly what I ran in my 5K in May, and I would’ve liked to see at least some improvement. According to my Garmin, which I started when I crossed the start line and stopped when I crossed the finish line, I ran a 27:02. My Garmin also told me I ran 3.14 miles, though, which obviously is farther than a 5K, albeit just slightly farther. If the course hadn’t been USATF certified, I would believe my Garmin’s measuring, but since the course was certified, my Garmin must have been off (it wouldn’t be the first time). By my Garmin’s measurement, though, I ran a 26:44 5K. So who knows. Speed is the last thing on my mind during long distance training, so I was shot after running somewhere between an 8:37 and 8:43 pace — a bit of a difference from the 10:30 to 11:30 pace I’ve run during the past three weeks of half marathon training. I wandered over to the post-race party and picked up some dinner for myself. Mmm. I haven’t had pizza in over a month, so this was delightful. I can’t say that I particularly enjoyed my time at the race, but I know all of my negative feelings were a result of that stupid voicemail from my property managers, not the race itself. I’m fine with the time I ran, and it was nice to just get out there and race. I also loved the location, since the paths we ran were the exact paths where I re-started my running career the first time I lived in Chicago. 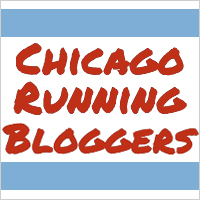 It’s definitely a race I would recommend to anyone looking for a nice evening 5K in Chicago. It was very well organized and fun race (unless you’re in the midst of an epic battle with your building management, of course).